Browning T-Bolt Installation Documentation — Jard, Inc. These directions will help replace the factory trigger assembly with a lighter, more efficient Jard T-Bolt trigger assembly. Using a 3/32" L Hex Key Allen Wrench remove the two screws on the bottom of the stock. Then remove the stock. Next using the 3/32" L Hex Key Allen Wrench remove the screw behind the trigger guard. This will allow the trigger assembly to be slid forward and replaced. Now replace the factory trigger assembly with the new Jard Browning T-Bolt Trigger Assembly. Slide the new Jard Trigger Assembly in and using the 3/32" L Hex Key Allen Wrench tighten the screw behind the trigger guard to hold the trigger assembly in place. Next, place the stock back around the barreled action and tighten the screws on the bottom of the stock using a 3/32" L Hex Key Allen Wrench. 1. To set the trigger, start by adjusting the sear engagement. The sear engagement set screw is located in the bottom most hole (C, as pictured below), and requires a 1/16" Allen wrench for adjustment. To set the sear engagement, rotate the set screw clockwise until the trigger fires. Then turn the set screw back, counterclockwise, approximately 1/4 turn. This completes the sear setting process. To ensure the sear engagement is to your liking, test the trigger and adjust as needed. 2. The next step in setting the trigger is adjusting the overtravel. The overtravel set screw is located in the middle hole (B, as pictured below), and also requires a 1/16" Allen wrench for adjustment. To set the overtravel, turn clockwise until the desired amount of overtravel is reached, testing as you adjust. 3. The final step in setting the trigger is adjusting the pull weight. The pull weight set screw is located in the top most hole (A, as pictured below), and requires a 5/64" Allen wrench to adjust. The pull weight adjustment set screw should be flush with the face of the trigger housing. 4. 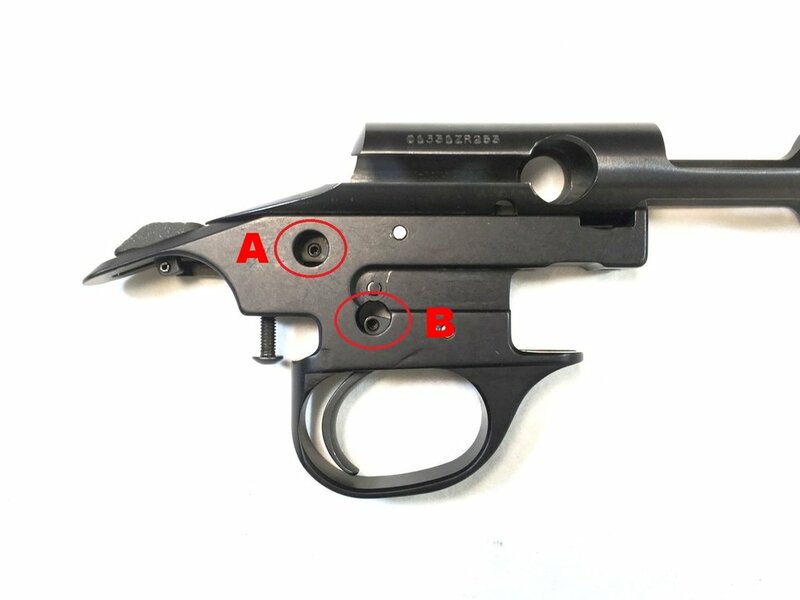 To adjust the safety on your JARD Browning T-Bolt Trigger Assembly, turn screw B (pictured below) until the non-cutout portion of the screw properly contacts the lever (approximately at a 7-8 o'clock position). 5. To adjust the bolt release, adjust screw A (pictured below) so that the not cutout portion of the screw properly contacts the lever (approximately at a 10-11 o'clock position).